Filmed over ten years throughout the Earth’s polar regions (filmed over 10-years in Antarctica, South Georgia, Falklands, New Zealand subantarctic, Svalbard, Greenland, Franz Josef Land, Canada and Iceland) by nature photographer Richard Sidey, Speechless – The Polar Realm is an award-winning non-verbal visual meditation of light, life, loss and wonder at the ends of the globe. In search of an individual viewing experience aided by the absence of spoken narrative, this cinematic voyages is guided through both powerful imagery of the natural world and a poignant, original score from composer and sound artist, Miriama Young. how the mariners' mythical wall of water could indeed be a quantum physics reality. Physicists have found an explanation for rogue waves in the ocean and hope their theory will lead to devices to warn ships and save lives. "A device on the mast of a ship analysing the surface of the sea could perhaps give a minute's warning that a rogue wave is developing," said Professor Nail Akhmediev, leader of the research at the Research School of Physics and Engineering. "Even seconds could be enough to save lives." Rogue ocean waves develop apparently out of nowhere over the course of about a minute and grow to as much as 40 metres in height before disappearing as quickly as they appeared. Ships unlucky enough to be where rogue waves appear can capsize or be seriously damaged, as happened in the Mediterranean Sea to the Cypriot ship Louis Majesty, which was struck by a rogue wave in 2010 that left two passengers dead and fourteen injured. The research by Professor Akhmediev and the team at the ANU Research School of Physics and Engineering, Dr Adrian Ankiewich and PhD student Amdad Chowdury, is published in Proceedings of Royal Society A. Professor Akhmediev said that there are about 10 rogue waves in the world's oceans at any moment. "Data from buoys and satellites around the world is already being collected and analysed. Combined with observations of the surrounding ocean from the ship this would give enough information to predict rogue waves," said Professor Akhmediev. The physics team has been using mathematical models to predict rogue waves and where they will appear. 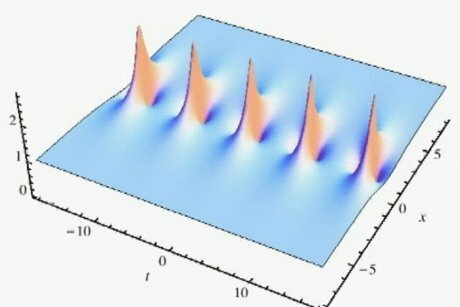 The theory may also explain freak waves that wash away people from beaches, as the rogue waves can sometimes transform into travelling waves known as solitons, that travel through the ocean like mini-tsunamis until they hit the coastline. Professor Akhmediev's theory also applies to other chaotic phenomena such as light travelling in optical fibres, atoms trapped in a Bose-Einstein condensate and the ionosphere in the upper atmosphere. The rogue wave is a special solution of the non-linear Schrodinger equation which is localised in time and space. The solutions were derived by adding terms to cover dispersion to the non-linear Schrodinger equation, forming the Hirota equations. Professor Akhmediev said that he next plans to add more terms to account for the influence of the wind on waves. The project area to be explored: Papahānaumokuākea Marine National Monument and the Johnston Atoll Unit of the Pacific Remote Islands Marine National Monument. During four separate cruise legs, NOAA and partners will investigate deep waters in and around Papahānaumokuākea Marine National Monument (PMNM) in the Northwestern Hawaiian Islands, Johnston Atoll in the Pacific Remote Islands Marine National Monument (PRIMNM), the Geologists Seamounts group, and the Main Hawaiian Islands. NOAA Ship Okeanos Explorer uses telepresence technology to transmit data in real-time to a shore-based hub where the video is then transmitted to a number of Exploration Command Centers located around the country as well as to any Internet-enabled device. Access to the video combined with a suite of Internet-based collaboration tools allow scientists on shore to join the operation in real-time, and allows the general public to follow the expedition online. 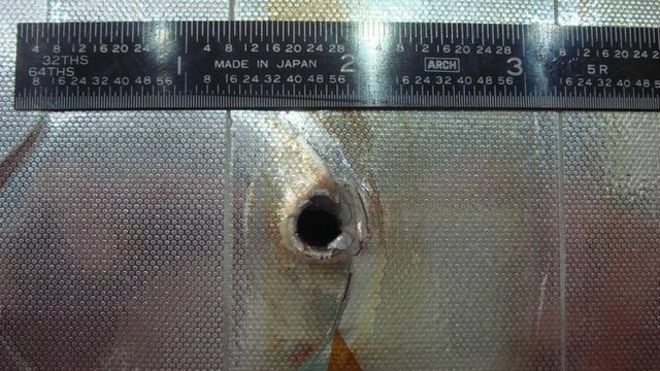 Image courtesy of the NOAA Office of Ocean Exploration and Research, 2015 Hohonu Moana. For three ice-free months a year, False Pass provides a shortcut for fishermen making their way between the Gulf of Alaska and the Bering Sea. This easternmost passageway—via Ikatan Bay, Isanotski Straight, and Bechevin Bay—is 70 km (37.8 nm) closer than the next crossing place at Unimak Pass. 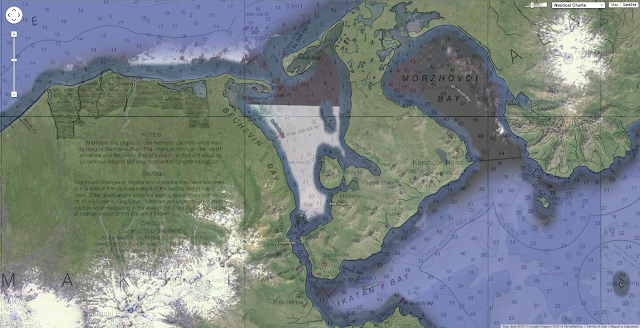 But in the Arctic, near-shore changes occur rapidly and can lead to maritime mishaps. The location of sandbars and channels can shift significantly because of the movement and melting of ice, seasonal sedimentation, and erosion. So each year, before vessels start to use False Pass, the U.S. Coast Guard must send out buoy tenders to mark the shifting channels. New remote sensing techniques might make that job easier and more accurate. Shachak Pe’eri, a researcher at the University of New Hampshire, has pioneered turbidity mapping as a proxy for bathymetric (depth) measurements. In enclosed water bodies with strong currents (such as bays and sounds), turbid channels show up on Landsat imagery. These turbid areas illuminate where currents are carving deeper channels that are safe for boat passage. 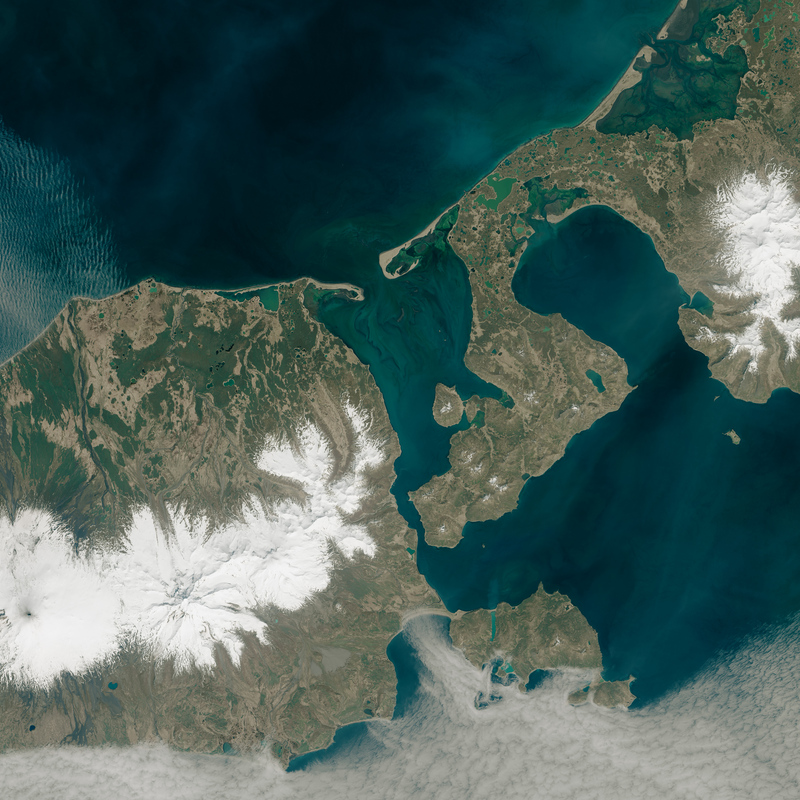 Pe’eri has been collaborating with colleagues at the National Oceanic and Atmospheric Administration and the Coast Guard to identify some of these areas from space. The field of satellite-derived bathymetry (SDB) was born with the launch of Landsat 1 in 1972. But it took two changes—the opening of the free Landsat data archive in 2008 and the 2013 launch of the more-advanced Landsat 8 satellite—to reinvigorate the use of satellite data by NOAA and other agencies involved in ship navigation. Different wavelengths of light penetrate water to differing degrees; shorter wavelengths (such as blue and green light) penetrate water to greater depths than longer wavelengths (near infrared, shortwave infrared). When water is clear and the sea bottom is bright, estimates of depth can be made by measuring the amount of reflectance observed by satellite and then modeling the how far the light penetrates. In the past, water clarity has been a limiting factor for satellite-derived bathymetry. If waters are too turbid—full of sediments that obscure light reflectance from the seafloor—then bathymetric measurements are difficult to make. But Pe’eri and his NOAA colleagues are thinking outside of the SDB-box by turning turbidity into a tool instead of an obstacle. “Bathymetry estimated from Landsat turbidity maps can help guide NOAA charting craft when they are mapping the channel each year. This saves time and it makes the process safer,” Pe’eri said. With the help of Landsat SDB turbidity maps, the new locations of sandbars can be better estimated. Recently this has led to the discovery of a new, straighter, and more geologically stable channel in Bechevin Bay, which was imaged (above) in May 2014 by the Operational Land Imager on Landsat 8. Pe’eri, S., Chukwuma, A., and Parrish, C. (2013) Satellite-derived Bathymetry: A Reconnaissance Tool for Hydrography. Hydro International, 17 (7), 16–19. Pe’eri, S., et al. (2015) Reconnaissance surveying of Bechevin Bay, AK, using satellite-derived bathymetry. U.S. Hydro 2015, National Harbor, Md., March 16–19, 2015. Pe’eri, S., et al. (2014) Satellite Remote Sensing as a Reconnaissance Tool for Assessing Nautical Chart Adequacy and Completeness. Marine Geodesy 37 (3), 293–314. GeoGarage blog : Avoiding Rock Bottom: How Landsat Aids Nautical Charting / What does the age of the survey mean for nautical charts? The animation depicts the distribution and movement of man-made objects orbiting Earth. In 2014, the International Space Station had to move three times to avoid lethal chunks of space debris. The problem also threatens crucial and costly satellites in orbit. So what is the scale of the space junk problem, and what can we do about it? Forty-five years ago the associate director of science at Nasa's Marshall Space Flight Center, Ernst Stuhlinger, an original member of Wernher von Braun's Operation Paperclip team, was asked by Sister Mary Jucunda, a Zambia-based nun, how he could suggest spending billions of dollars on spaceflight when many children were starving on Earth. Today, Stuhlinger's response still provides a powerful justification for the costs associated with space research. "It is certainly not by accident that we begin to see the tremendous tasks waiting for us at a time when the young space age has provided us the first good look at our own planet," he said. 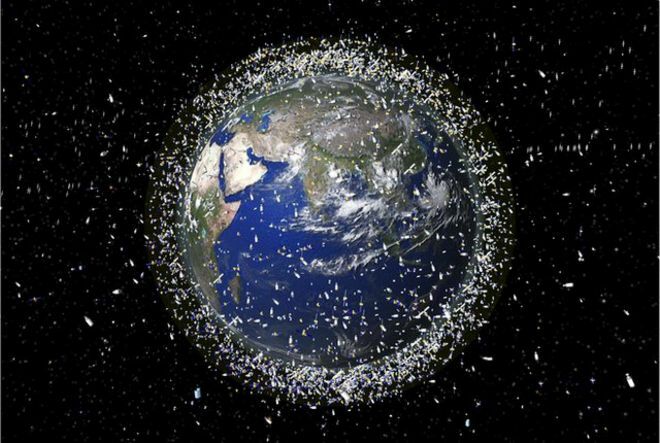 Space Debris - How It Got There, What To Do About It? Experts have estimated that there are 29,000 objects 10 cm or larger orbiting Earth. Only 7 percent are working satellites. 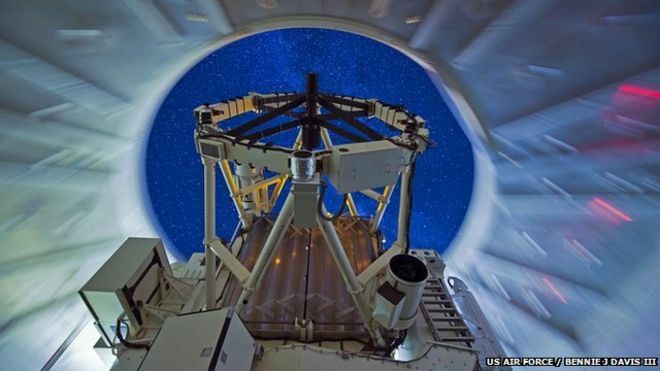 The European Space Agency is looking at ways to mitigate the threat. "Very fortunately though, the space age not only holds out a mirror in which we can see ourselves, it also provides us with the technologies, the challenge, the motivation, and even with the optimism to attack these tasks with confidence." Indeed, we have made great use of Stuhlinger's "mirror" to meet many of society's biggest challenges. Sadly, the space environment has borne the brunt of our increasing reliance on satellites and our long-lived belief that "space is big". More than 5,000 launches since the start of the space age, each carrying satellites for Earth observation, or communications, for example, have resulted in space becoming increasingly congested and contested. The issue has been examined for a BBC Horizon documentary on BBC Two. Perhaps the most visible symptoms of the space junk problem are the regular collision avoidance manoeuvres being performed by the International Space Station (ISS), and the increasingly frequent and alarming need for its occupants to "shelter-in-place" when a piece of junk is detected too late for a manoeuvre. The systems on the ISS that provide vital life support are also responsible for its unique vulnerability to a debris impact - a pressurised module in a vacuum might behave like a balloon if punctured. 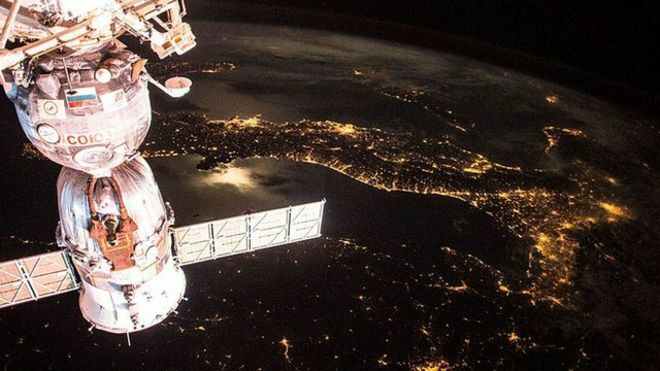 The recent "red conjunction" (where a piece of debris comes close enough to pose a threat to the space station) involving a fragment from a Russian satellite on 17 July this year was yet another demonstration of the growing threat from space junk. Thanks to the hit film "Gravity", and the Oscar-nominated performance of Sandra Bullock, we can now readily appreciate the anxiety that must be felt by the astronauts and cosmonauts aboard the International Space Station whenever they receive such a "red conjunction" call. At higher altitudes the amount of space junk is substantially greater, but only robotic spacecraft are exposed there. Nevertheless, these satellites are some of the most valuable for understanding our planet. Due to this congestion, there is an increasing chance that the space junk population could become self-sustaining. That is, more junk could be created by collisions than is removed through the natural decay caused by atmospheric drag. Indeed, we already have some experience of this: in February 2009 two relatively small satellites collided over Siberia creating about 2,000 new fragments that could be tracked, with many still orbiting today and regularly passing close to other satellites. Self-sustaining collision activity is something else that the film Gravity showed us. Dubbed the "Kessler Syndrome" after the Nasa scientist Don Kessler (now retired) who recognised and described this process with Burton Cour-Palais in 1978, such a scenario is a real - albeit often exaggerated - possibility. Concerns of an uncontrollable growth of the space junk population and the loss of key satellites that enable us to address our society's problems have prompted scientists to look for ways to remove junk from space: If we can remove the problematic junk, then we can stall or even prevent the Kessler Syndrome. This is no easy task, however, requiring new technologies, potentially new laws and - crucially - financial investment. The European Space Agency (Esa) is taking the lead, working on a mission it calls "e.Deorbit" that has the objective of removing a large European satellite from space. Against the background of an increasing space junk problem, a renaissance is now taking place in space; what was the principal domain of governments and space agencies, with their large, multi-billion dollar satellites, is becoming the province of an emerging industry that is revolutionizing the use of space. Diminutive companies and start-ups, in particular, are showing how small budgets do not necessarily mean small ambitions. For example, San Francisco's Planet Labs, are using "cubesats" to redefine the market for Earth imagery. Their Dove satellites are smaller than a briefcase, yet have the capability to deliver high-resolution images of the Earth for a multitude of purposes. 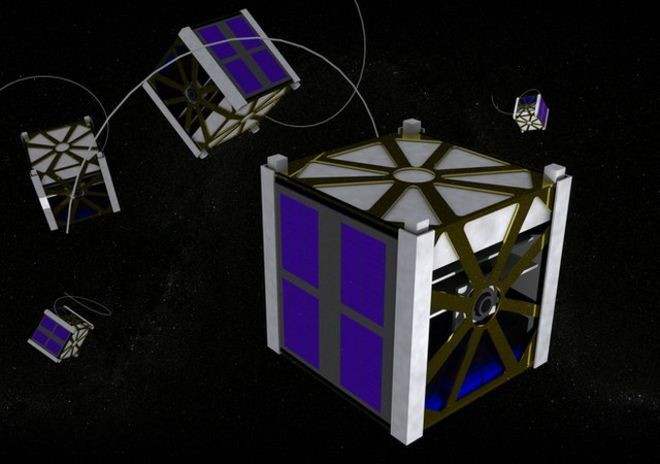 With plans by other companies, including SpaceX and OneWeb, to develop large constellations of small, low-cost satellites, there is some concern within space agencies about the long-term consequences of the ubiquitous and rapid commercialisation of space. In particular, these concerns focus on the abrupt increase in the number of satellites orbiting the Earth, which could substantially increase the need for collision avoidance manoeuvres and hasten the onset of the Kessler Syndrome. In 2014, Brian Weeden, a technical adviser for the Secure World Foundation, described space junk as a "super wicked problem." Such problems, he explained, are particularly challenging to solve because time is running out, there is no central authority providing guidance or support, those seeking to solve the problem are also causing the problem, and the solutions are left for future generations to find. The critical first step in tackling super wicked problems is to expand the group of people who support measures that reduce the risk. Indeed, there are encouraging signs that both old and new space actors understand the need to mitigate negative impacts of their activities in space and to limit the consequences for other space users. Several companies, including Planet Labs and OneWeb have affirmed their commitment to tackle the space junk problem in the public domain. However, much work is still needed to fully understand the problem, develop technologies (such as e.Deorbit), remove legal and political barriers, and to increase awareness. The Kessler Syndrome remains an ever-present threat. The space age has enabled global solutions to some of society's biggest challenges, just as Ernst Stuhlinger described in his letter to Sister Mary Jucunda. It has also held out a mirror and shown us that a continuing disregard for the space environment will surely affect our ability to deliver these solutions, with potential consequences for millions of people. The Open Polar Sea was a hypothesized ice-free ocean surrounding the North Pole. This unproven (and eventually, demonstrated false) theory was once so widely believed that many exploring expeditions used it as justification for attempts to reach the North Pole by sea, or to find a navigable sea route between Europe and the Pacific across the North Pole. The theory that the north polar region might be a practical sea route goes back to at least the 16th century when it was suggested by Robert Thorne. William Barents and Henry Hudson also believed in the Open Polar Sea. For a time, the theory was put aside due to the practical experience of navigators who encountered impenetrable ice as they went north. But the idea was revived again in the mid-19th century by theoretical geographers such as Matthew F. Maury and August Petermann. At this time, interest in polar exploration was high due to the search for John Franklin's missing expedition, and many would-be polar explorers took up the theory, including, notably, Elisha Kent Kane, Dr. Isaac Israel Hayes, and George Washington De Long. It was believed that once a ship broke through the regions of thick ice that had stopped previous explorers, a temperate sea would be found beyond it. 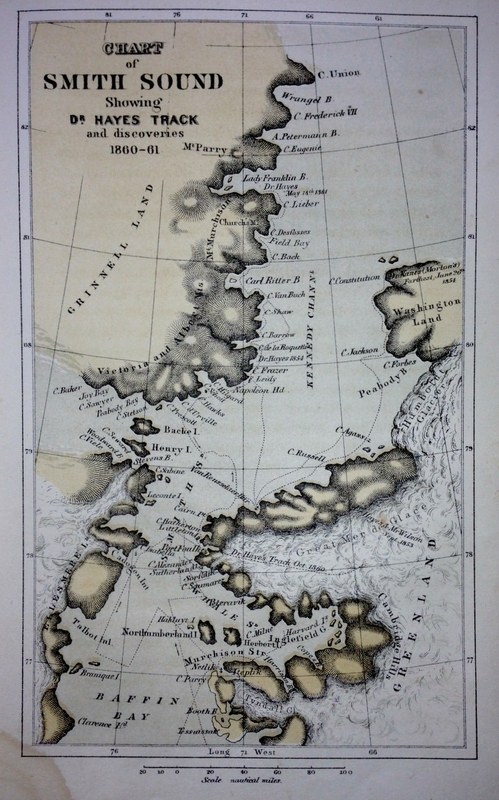 “Chart of Smith Sound Showing Dr. Hayes Track,” from “The Open Polar Sea,” 1867 1st edition. Given that we know today that the North Pole was covered with thick ice for much of the period, the idea of the Open Polar Sea seems patently ridiculous. Since sea ice only forms in proximity to land (now known to be a false theory itself), if there were no land near the North Pole, there would be no ice. Since there is perpetual sun during the Arctic summer, it would melt all the ice. Russian explorers found large areas of open water north of Spitsbergen, so surely there were other areas of open water elsewhere. Maury, Petermann, and other scientists who studied ocean currents in the 19th century hypothesized that warm northward currents such as the Gulf Stream and Kuroshio Current must rise to the surface and result in an ice-free sea near the pole. Extrapolation of temperature readings taken in subpolar regions indicated that the region of greatest cold would be at about 80° north instead of at the pole. Migration patterns of certain animals seemed to suggest that the polar region was a hospitable place for them to live. The Open Polar Sea theory was debunked gradually by the failure of the expeditions in the 1810s through the 1880s to navigate the polar sea. Reports of open water by earlier explorers, such as Elisha Kent Kane and Isaac Israel Hayes, fueled optimism in the theory in the 1850s and 1860s. Support faded when De Long sailed USS Jeannette into the Bering Strait hoping to find an open 'gateway' to the North Pole and was met by a sea of ice. After a long drift, pack ice crushed the Jeannette and her survivors returned home with first hand accounts of an ice-covered polar sea. Other explorers such as British explorer George Nares confirmed this. By the time Fridtjof Nansen and Otto Sverdrup drifted through the polar ice pack in Fram in 1893–1895, the Open Polar Sea theory was defunct. This visualization shows the evolution of Arctic Sea Ice volume for every day since January 1979 to July 2013. Based on the rate of change of volume over the last 30 years, the first ice-free summer day in the Arctic Ocean (defined as having less than 1 million km² of sea ice) is expected to happen between 2016 and 2022, and thereafter occur more regularly with the trend of ice-free duration extending into August and October. Nevertheless, scientific studies in the 2000s of climate change project that by the end of the 21st century, the annual summer withdrawal of the polar ice cap could expose large areas of the Arctic Ocean as open water, and an ice-free Arctic is possible before 2015 due to Arctic shrinkage. Although the North Pole itself could potentially remain ice-covered in winter, a navigable seasonal sea passage from Europe to the Pacific could develop along the north coast of Asia. Cases of an ice free North Pole have already been discovered. io9 : The Open Polar Sea, a balmy aquatic Eden at the North Pole? In the past, sailors on whaling ships would carve whale teeth into works of art in a process called scrimshaw. These pieces would be brought home to loved ones as mementos of the voyage. Design incubator Studio Swine is attempting to recycle found materials and turn this aged art form into a more sustainable practice. In this short film, travel to remote parts of the ocean, where “the closest people are in a space station,” and watch as the process of collecting ocean trash and transforming it into beautiful treasure unfolds. Gyrecraft is an exploration into maritime crafts which exists in every coastal or island culture around the world each with its own unique identity, utilizing what the sea provides. Many of these crafts took place onboard boats during long voyages as a way of making vital repairs or passing the time at sea. Studio Swine went on a journey of 1000 nautical miles collecting plastic on the way from Azores to the Canaries through the North Atlantic Gyre with the Solar Extruder; a machine they designed and built which melts and extrudes sea plastic using the Sun.